List of Adjectives ending in -ed and -ing. We form some adjectives from verbs by adding -ing or -ed endings to them. Adjectives that end -ed and adjectives that end -ing are often confused. 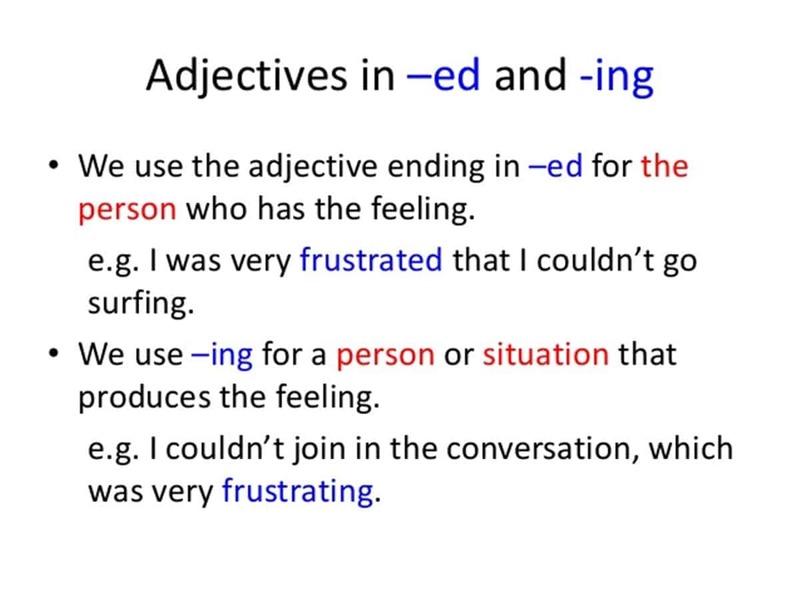 Learn the difference between Adjectives Ending in -ED and -ING with useful rules and examples. Adjectives ending in –ing describe the effect that something has on someone’s feelings. They describe a process or state that continues over a period of time and have an active meaning. The suffix –ing is related to cause. When the adjective ends in –ing, it means that the person or thing causes this particular effect. Snakes terrify me. They are such terrifying creatures. Julia thinks politics is very interesting. Adjectives ending in –ed describe people’s feelings. They have the same form as the past participle of a transitive verb and have a passive meaning. When the adjective ends in –ed, it means that the person or thing experiences this particular effect. Snakes terrify me. I’m always terrified when I see one. Julia is very interested in politics. We were shocked when we heard the news. I’m extremely interested in history. He was very bored with the lecture. I was not very surprised.